Dental visits often mean enduring discomfort and pain. Most people bear the soreness as the price for good oral hygiene. Others, however, cannot rationalize away the pain and they experience dental fear. Many factors may contribute to the feelings of intense fear. 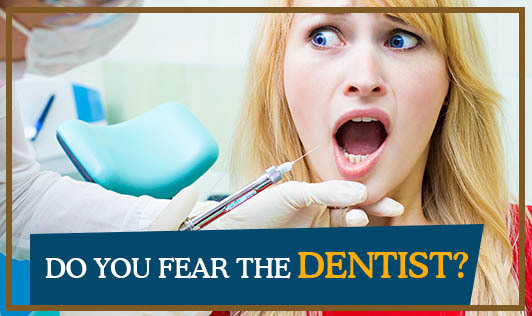 Fear of the dentist is common and it is also based on a past experience. Dental phobia, the most intense emotion, is an extreme feeling of dread or even terror that may or may not be based on a past experience. Causes: Most dental fears are rooted in previous bad experiences at the dentist's clinic. Pain is the most frequent bad experience, but it is not necessarily a cause of dental phobia if the dentist is perceived as caring and compassionate. A child raised in an environment where dental visits are dreaded is more likely to fear the dentist than a child whose parents treat dental appointments with little anxiety. Consequences: Dental fear can be so overwhelming for some people that they avoid the dentist. Avoiding regular dental check-up leads to poor oral health. This eventually results in loose or broken teeth and gum disease. Unattractive teeth may hurt a person's self esteem. Poor oral hygiene is linked with poor overall health and conditions such as heart disease. Solution: The first step in overcoming dental fear is to acknowledge it. Identify the specific aspects of the dental visit that you fear the most, such as fear of pain, needles or loss of control. Consult with your dentist to discuss your concerns. Practice relaxation techniques to help you conquer your fear. Talk to your dentist and feel comfortable!